Easily one of the most popular in the state, Moore Cove Falls starts as a cascade, but then drops over a high, overhanging bluff, making it a free-fall. The bluff is composed of lots of horizontally layered rocks. It's a low-flow stream, so people frequently stand directly under the falls during warmer months. It doesn't dry completely up, though. Less daring visitors - or those who come during colder months - can easily walk behind the falls and stay dry. Dangling vines and overhanging vegetation, with tall, straight trees all around, contributes to the lush scene. After viewing some high-resolution aerial photos of the area, I was surprised to discover that Moore Cove Falls is actually on an eastern tributary of Moore Cove Creek, while there is another, smaller falls on Moore Cove Creek itself which most people call "Little Moore Cove Falls" or "Moore Cove Falls #2". From the intersection of US Hwy 276 and 64 and NC Hwy 280 in Brevard, follow US 276 west for 6.7 miles, passing Looking Glass Falls on the right. There is a sizeable parking pull-off on the right for the Moore Cove Falls trailhead - use caution when parking and pulling out, as it's just around a blind curve. Cross Looking Glass Creek on the wooden bridge beside the road bridge to start the Moore Cove Falls trail. It's about 0.7 mi. to the falls, on a newly rehabbed, wide, easy path with several neat bridges, and no intersections. This is an excellent hike for families and kids! 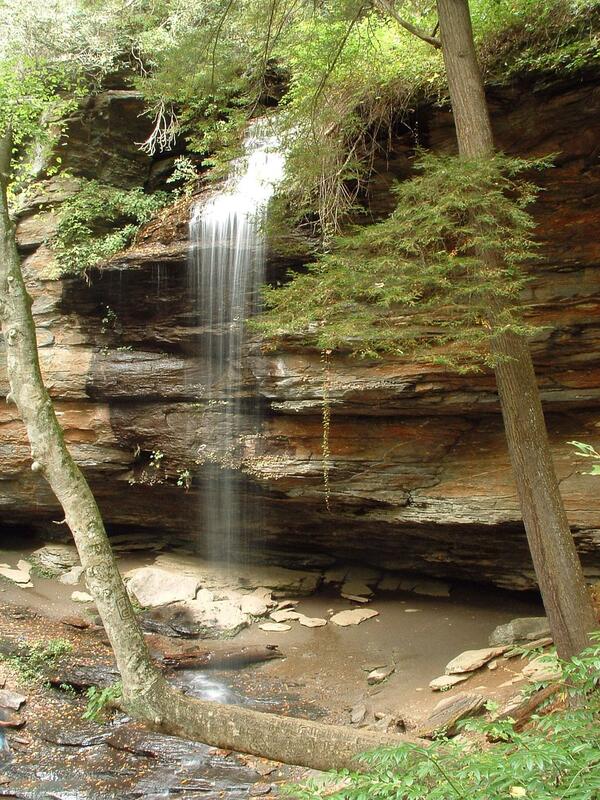 This is one of the Best Hikes on our sister site, HikeWNC.info.